Dundee were left rooted to the foot of the Ladbrokes Premiership as they were eased aside 2-1 by Tayside rivals St Johnstone. After a poor first half, home skipper Steven Anderson broke the deadlock for Saints before Danny Swanson added a second with a penalty. A spot-kick at the other end from Rory Loy pulled one back for Dundee in the 88th minute but it was too late to avoid a fifth successive defeat. St Johnstone, meanwhile, leapfrogged above Rangers into fourth and level on points with Hearts. After a placid start from both sides, Dundee should have taken the lead in the 13th minute. The midfielder's square pass was perfect for Yordi Teijsse but the striker's tame shot from 14 yards was straight at Zander Clark in the Saints goal. Clark was called into action eight minutes later to push a Tom Hateley free-kick behind and to grab Teijsse's header from the resultant corner. Dundee's chances sparked the hosts to life but Chris Kane could not get a flick on Murray Davidson's low ball following a scramble that saw the Perth men appeal for a penalty when Steven MacLean went down in the box. 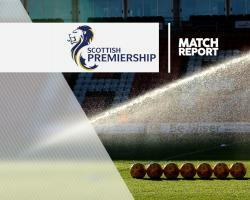 There was little change to the scrappy pattern of the game after the interval, but St Johnstone increasingly gained the ascendancy as they upped the tempo of their attacks. Liam Craig's left-foot free-kick from the right curled menacingly into the heart of the Dundee box and Anderson stretched to volley in at the back post. Dundee could not get going in the final third and their task was made twice as hard when Saints netted a second with 15 minutes remaining. There was almost a third in the 82nd minute when Swanson's superb chipped pass found Michael Coulson but the substitute's header crashed back off the crossbar. Anderson's careless push on Teijsse allowed Loy to pull one back from the spot with two minutes left but the visitors left it too late and could not find an equaliser.